My blog is called Love, Food & Beer, but most of my posts are about Food and Beer. So, in an effort to answer this question, I’ve decided to do a little show and tell by sharing the following a picture, and showing you the love. Let’s begin with the mug. We’ve all seen The Lion King. We all know the song – sung affectionately to a lost lion cub by a rat and a pig – and most of us could probably sing the refrain on cue. I know I can. That being said, I don’t want to spread the perception that I’m such a big fan as to have purchased myself a mug. It was actually given to me a few years ago by one of my graduating seniors who I had taught during both her junior and senior years of high school. It came with a heartfelt note explaining her appreciation for my support, and her rationale behind this gift. She explained it was an approximation of the way that I had taught her to approach her life. She assured me that it was not in the carefree, bug-eating, literal “no worries” mentality explained in the film, but in an interpretation thereof. As she explained it (or at least as I understood it), the version of ‘Hakuna Matata’ that I had imparted upon her was not that there wasn’t anything to worry about, but that if there was, she should do something to change that; that she needed to take control of and influence her own ‘worries’ and her own happiness. It was wonderful, and I keep the mug around as a reminder of that. Plus I need something to drink my coffee from. Going counterclockwise around the picture, you’ll notice that there’s a still of ‘D’ from The Wire on TV in the background. That’s because The Wire is awesome. If you haven’t seen it, you should go watch it. Now. To the left, you’ll see Attila. Attila is my wonderful, loving, moronic English Springer Spaniel. He’s a master beggar, and – as you can see – has those distinctly expressive, watery eyes that implore you to share your bacon with him. Which I did. Partially because of those eyes, but also because he’s the best. I love my pup. You know that hypothetical question where you’re asked what you would do if your dog and random person were about to get hit by cars, and you could only save one? I would save my dog every time. Unless the human was my wife, or someone else I love, then I’d use my hypothetical super powers to stop both cars. Hey, It’s hypothetical, I can do whatever I want. In the foreground, you’ll see waffles and bacon. The waffles are nothing special, in fact, they’re the result of a lazy Sunday morning and an off-brand box of waffle mix. Not that those traits don’t make them delicious. I love waffles, as does my wife, who had requested them, and – at the time of this picture taking – was sitting out of frame, enjoying every morsel. And finally, there’s the bacon. The bacon was special. Those crispy strips that my gun-shy pup is eternally eyeballing are actually homemade strips of bacon that my friend cured and smoked. It may have been his first or second attempt at bacon-creation. In fact, I think that this batch may have been the one that he thought was slightly over-salted, but what really matters is that they’re something shared. I’ve ranted about bacon making things better, and you may agree or disagree with me regarding my opinion, but what I think most people would have a hard time disagreeing with is the idea that what makes a better bacon is the addition of the love and care that goes into something homemade. Plus, I remember it being delicious. 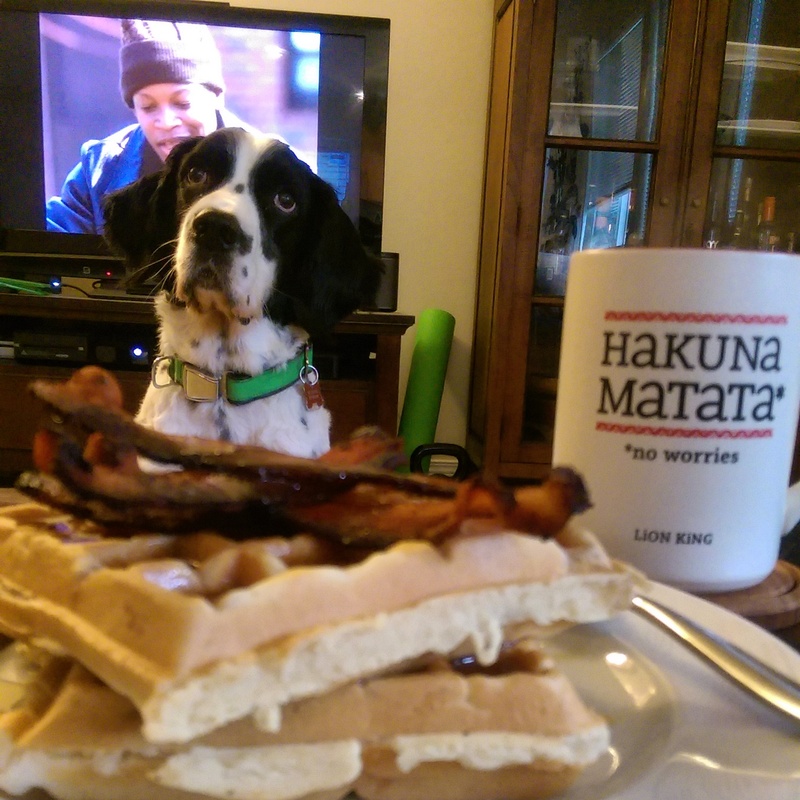 I think I’ve found a little bit of it in a strip of bacon, a waffle, a coffee cup, and the dopey face of my dog.